Though God protected her by showing Joseph in a dream that he should accept her in marriage in spite of her being pregnant, the story of her pregnancy was out. 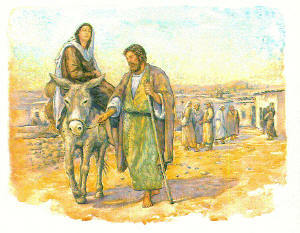 Nevertheless, Joseph faithfully married an already pregnant Mary. A legacy of raised-eyebrow, finger-pointing gossip would follow them and Jesus throughout their lives. These were revolutionary ideas. Many of his contemporaries, including his disciples, were shocked. Women were overjoyed and grateful, of course, and many dedicated their lives to his service. Let’s take a look, from the historical narratives in Scripture, at a few of these women of faith and how Jesus dealt with them. The risen Jesus appeared to her first. It’s ironic that in a time when women could not be legal witnesses, Jesus Christ chose women as the first witnesses of his resurrection. As British writer Dorothy L. Sayers said: “Perhaps it is no wonder that the women were first at the Cradle and last at the Cross. They had never known a man like this Man—there never has been such another. A prophet and teacher who never nagged at them, never flattered or coaxed or patronised: who never made arch jokes about them…who rebuked without querulousness and praised without condescension: who took their questions and arguments seriously” (Are Women Human?, page 47). Jesus expected women as well as men to learn from him. Jesus did not feel that women’s work— or men’s work, for that matter— wasn’t important. He was not saying it is wrong to be diligent and careful about our responsibilities. Christ was saying we should get our priorities straight. Women were called to be disciples of Jesus, just as men were, and women were expected to fulfill their spiritual responsibilities, just as men were. “You hypocrites! Doesn’t each of you on the Sabbath untie his ox or donkey from the stall and lead it out to give it water? Then should not this woman, a daughter of Abraham, whom Satan has kept bound for eighteen long years, be set free on the Sabbath day from what bound her?” (verses 15-16). Before his most venomous critics, Jesus publicly showed his concern and high regard for this woman, someone whom others had probably seen for years as she struggled in her affliction to come to the synagogue to worship God. Someone whom they may well have shunned because she was a woman and because she was disabled. Now we have a new life in Christ. All Christians have a new relationship with God. Through Christ, we—both male and female—have become God’s own children and one in Jesus Christ. Christ is calling all—men and women—to repentance and a new way of life. Jesus showed through personal example that it’s time to put aside the old biases, the feelings of superiority over others, the feelings of resentment and anger, and to walk in newness of life with him and through him. And, for those of you who haven’t taken that step, just as he freed that poor woman from Satan’s debilitating physical affliction on her, Christ promises to free you, and all his “daughters of Abraham” who repent and follow him. Jesus Christ wants you in his kingdom. Historian Ruth A. Tucker is a visiting professor at Trinity Evangelical Divinity School. Dr. Tucker has also taught at Calvin College and Fuller Theological Seminary. She holds a doctorate in history from Northern Illinois University and is a popular speaker at seminars and Christian conferences. Her books include Daughters of the Church (with Walter Liefeld) and Guardians of the Great Commission. Question: You have said in several of your books that the Bible shows that Jesus Christ had an unusual sensitivity toward women. Ruth Tucker: Jesus certainly did have a remarkable perspective and attitude toward women. He was the Messiah, and he had come to bring the kingdom of God. He had come to live and to die and send a message to the whole world. He needed to mobilize all of those who would believe, all of his followers, including women as well as men. We read about the 12 men who followed Jesus, but there were women in his company as well. 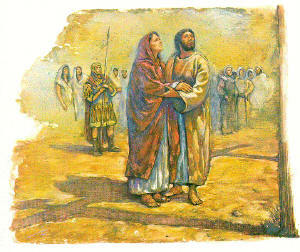 Mary Magdalene and the other Marys followed him and carried the message of who Jesus was. 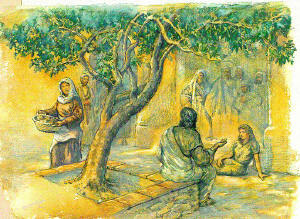 What these women did goes along well with Jesus Christ’s great commission that he gave before he died. The men and women who followed Jesus had that great commission. It was not a commission that should cause people to rival each other in leadership or prestige or position and power, but rather a commission that calls for servitude. The great commission is radical. It demands sacrifices and self-denial and calls for servanthood. Unfortunately in the church today, often following the management model in the world, we look for prestige and power, even as followers of Jesus. We may not intend that, but often that happens. Q. Can any woman today— whether she is a young mother with several children, or perhaps a mother whose children have grown up and left home—serve Christ? A. Absolutely. Any woman, and any man, should reach out to follow Jesus. We have such an incredible heritage of women reaching out in their communities. Often, when they have little children, they will involve the little children in their ministry. They will get their adolescents, teenagers, all involved in the ministry as well. This can be done in the family setting. It can be done in groups. We have women reaching out, often in social service ministries, helping others, meeting the needs of others in the community, but bringing the message of the risen Savior at the same time. Q. As you know, Paul refers to the older women teaching the younger women. How do you feel older women can serve the younger women in the church? A. Older, more mature women in the faith certainly can teach younger women and less spiritually mature women in the church. This ministry should also include women who may not be closely associated with the church, but in the community, who may have an interest in knowing more of the gospel of Jesus Christ. Women working together to serve in the community have been a major factor in church growth through the generations. When women reach out to other women, to other families, they help and encourage them and also bring the gospel message at the same time. Women, young and old, ought to see themselves as they read the pages of the New Testament, that they are there, and that they have been there through the generations, following the command of the great commission. Often, women are the ones who carry on the faith. That may be partly because men have been secularized more than women. Men are out in the marketplace, out in the workplace and in the world. They are often challenged in their faith more than women. Women have traditionally been in the home. They are the ones rearing the children. They are the ones passing along the faith. 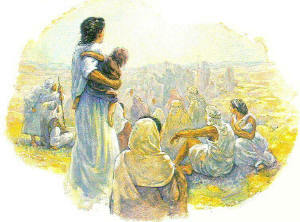 Women have to see themselves from New Testament times on through history in this role. God has especially used women, given them a gift of faith from the very women at the cross, for proclaiming the resurrection down through the centuries. We must continue that in our neighborhoods, not just in our homes, but in our communities. Today, women are going out in the workplace; more and more. I am concerned that passing on the faith in the family and in the neighborhood may be getting left behind. As women are getting more secularized and involved in their own jobs and positions, they find their time more and more .limited. As women, we need to hang on to our heritage, and encourage men also to be involved in bringing the gospel into the home and into the community, carrying on that great commission, to preach, teach, disciple and baptize. Q. Yes, women are busy, but economic realities here and around the world have forced many women out of the home into the labor force. How can these women find time to serve? A. I think they need to serve the Lord wherever they are. I would challenge working women that the workplace is a wonderful place to carry out the great commission. When Jesus said to go out to all the world, certainly the workplace is one of those places to reach out and simply share the faith, even as Mary Magdalene did, telling others about the risen Savior whom she had encountered.